ESPN2 is an American basic cable and satellite television network that is owned by ESPN Inc., a joint venture between The Walt Disney Company (which owns a controlling 80% stake) and the Hearst Corporation (which owns the remaining 20%). ESPN2 was initially formatted as a network for a younger generation of sports fans; by the late 1990s, this mandate was phased out as the channel increasingly served as a second outlet for ESPN´s mainstream sports coverage. As of February 2015, ESPN2 is available to approximately 94,379,000 pay television households (81.1% of households with at least one television set) in the United States. Sports events presented on ESPN2 originally tended to be alternative sports such as poker, billiards, lumberjacking, extreme sports and, more recently, drum and bugle corps. However, in recent years ESPN2 has broadcast increasingly more mainstream sporting events, including Major League Baseball games, the East-West Shrine Game, much of the 2006 World Baseball Classic, regular season KHL games, many Major League Soccer games, NCAA basketball games, the WNBA, the Arena Football League and Saturday afternoon NASCAR Nationwide Series races. In 2011, ESPN2 also acquired broadcast rights to delayed coverage for some American Le Mans Series events, with series´ major events airing on ABC. The channel has also become ESPN´s home for tennis coverage. The showpieces are all four of the "Grand Slam" tournaments: the Australian Open, the French Open, Wimbledon and the US Open. Also featured on ESPN2 are the ATP World Tour Finals and U.S.-based tournaments, including the ATP Masters 1000 events at Indian Wells and Miami, as well as the US Open Series. Most of ESPN´s soccer output has been broadcast on ESPN2 including Major League Soccer, Premier League and La Liga matches; the channel also broadcast the United States´ FIFA World Cup qualifiers in 2009. ESPN2 formerly broadcast matches of the UEFA Champions League, until rights for that tournament moved to Fox Soccer and its sister networks. In 2003, ESPN2 began broadcasting Major League Lacrosse games. In March 2007, ESPN2 and the league agreed on a new broadcast contract that will run until the 2016 season. ESPN2´s former flagship show, the morning sports/entertainment program Cold Pizza, achieved minimal success and saw several format and host changes. In January 2006, it was supplanted by the television simulcast of ESPN Radio´s Mike and Mike in the Morning (which moved from ESPNews) and moved to a later time slot (10:00 a.m. to 12:00 p.m. Eastern Time). In May 2007, Cold Pizza moved from New York City to the ESPN headquarters in Bristol, Connecticut and was renamed ESPN First Take. After ESPN became part of a new broadcast contract with the association, ESPN2 also premiered the new daily show NASCAR Now (similar to the previous RPM 2Night, except only focusing on NASCAR) in February 2007. Quite Frankly with Stephen A. Smith, a program that featured interviews with popular sports figures, had averaged extremely low ratings, and had also faced several timeslot changes, until it was finally canceled in January 2007. ESPN2 has also simulcast many game telecasts with ESPN, usually as a part of an ESPN Full Circle special, which covers a single telecast across several ESPN networks, with each network providing a different form of coverage (such as different camera angles). ESPN2 also simulcasts some programming from ESPNews, often during local blackouts of scheduled national game telecasts, and for a while provided a simulcast of ESPN Deportes´ edition of SportsCenter on Sundays. In return, ESPN2 programming is often seen on ESPN during blackouts of games in certain markets. ESPN2 also often carries SportsCenter at times when the broadcast on ESPN is delayed by a sporting event that overruns into one of the program´s scheduled timeslots. ESPN and ESPN2 also jointly aired two episodes of a documentary special called This is SportsCenter, in which ESPN showed a documentary showing the production of an edition of SportsCenter, while the finished product aired on ESPN2. The documentary would usually air for two hours, where the first hour would cover the preliminary production of the night´s show on ESPN, while ESPN2 aired ESPN´s regular programming. The second hour usually spent time at production control while covering reaction to the night´s developments. Both ESPN and ESPN2 carried ABC News´ coverage of the terrorist attacks on the World Trade Center and The Pentagon (and the related crash of United Airlines Flight 93 in Shanksville, Pennsylvania) on September 11, 2001. ESPN2 also aired the 2008 SEC Men´s Basketball Tournament championship game in 2008 to most of the nation, since a storm damaged the original game site, the Georgia Dome, causing the schedule to be rearranged and site to be moved to the smaller Alexander Memorial Coliseum. The new schedule was in conflict with CBS´s coverage of the Big Ten Championship Game; the game was produced by CBS. In the territory of the Southeastern Conference, the Big Ten game aired on ESPN2. ESPN2 operates a high definition simulcast feed, which broadcasts in the 720p resolution format and was launched in January 2005. 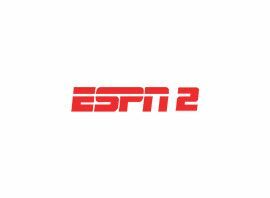 In January 2011, the separate ESPN2HD branding began to be phased out, as in May of that year, the channel would shift to using the AFD #10 flag to transmit the channel´s standard definition feed in letterboxed widescreen, mirroring the display of the high definition feed.